Proverbs 17:22 NLT: A cheerful heart is good medicine, but a broken spirit saps a person's strength. Much has been said about the power of laughter to heal. There have been numerous studies linking positive mental and emotional states and better health. Some studies have shown that positive emotions cause the body to produce more immune cells, while negative ones tend to suppress one's immune system. The specifics of how attitudes contribute to health are still not fully understood. We do know that the body's immune system is influenced by brain chemistry, which is in turn affected by emotional experiences. Emotions such as happiness, stress, anger, anxiety and fear affect us at a biochemical level because every emotion has a frequency. Every emotion produces a specific and distinct biochemical reaction that affects the entire body. Many degenerative diseases, and most certainly cancer, have multiple causes. That being so, many factors contribute to one's risk profile, and a multi-faceted approach in preventing and dealing with disease is always most effective. We cannot ignore the spiritual and emotional connections. We overlook their importance to our own detriment. Consider another finding. Pro-zeranine is a powerful chemical substance that is actually able to reverse addictions naturally since they are due to a lack of this substance. 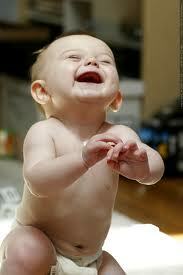 It has been found that laughter actually produces pro-zeranine in the body! While we cannot control circumstances and situations we may be faced with, we can control how we respond to them and we certainly can take control of our attitudes. Cultivating a cheerful heart is one of the most pleasant medicines I can imagine taking! As always, Father really does know best. How often to do you laugh each day? Do you find opportunities to laugh every day? Intentionally find opportunities to see the humor in your everyday situations this month and make sure you laugh every day! Comments for Taking Your Medicine? Diane - dealing with health problems can be so overwhelming - but we are NEVER left on our own! I'm so grateful what I wrote was a blessing to you. Please feel free to visit my website - there are free resources I'd love you to have and you can always email me with questions or for prayer! God bless you and thank you for taking the time to send a comment. I just find this site this morning. I have been struggling with health issues since Jan. 2011. It seems that one thing after another keeps happening to me health wise. I continually have to stop myself from obsessing over the problems, being anxious and fearful. I am going to the Mayo Clinic in August to try and get some answers. After reading this, I am reaffirmed in my efforts to stay focused on Jesus and in laughing more.....I am thrilled to see a Christian perspective towards health. Response for Taking Your Medicine? Pat - I so appreciate your comments on this study. You hit a very crucial point as it relates to weight control or weight loss. Being aware of attitude and using tools to detox and cleanse ourselves of negative attitudes is a very often overlooked factor and reason why many "diets" fail. We can NEVER leave God out of the equation and expect to succeed! This is another really good reading,I have no problems with "laughter" I enjoy it very much. But controlling the "attitude" is a real problem,here is where I need victory and thank God I'm working on that. There are times I get so bent out of shape over small things and then I eat,eat and eat.It's amazing how much attitude has to do with everything! But God- I'm so happy because with God all things (even controlling my attitude) are possible and it's because of this hope I can keep going. I will not give up because I know there is a plan for me!!! To lose this weight and keep it off "Hallelujah Praise God" I know it's so.